This eloquent piece was written by Mark Hyman, MD, one of the leaders at the Institute for Functional Medicine. “Imagine a time when people died or suffered from incurable acute infections. Imagine a time before antibiotics — when women died of simple childbirth fever, when a bad chest infection could lead to death, when a strep throat caused heart failure, when limbs were amputated because of an infected wound. Those commonplace occurrences seem unimaginable now. Yet that is the exactly the state of medicine today as we face the tsunami of lifestyle-related chronic diseases that will cost our global economy $47 trillion over the next twenty years. These diseases are eminently preventable and treatable, and yet currently, every year, they kill twice as many people around the world as infectious diseases do. As we spend more and more for health care, we get less and less. America has worse health care outcomes and lower life expectancy than almost every other developed nation. As we invent new drugs and procedures, chronic diseases continue to rise in America, and — as developing countries adopt the worst of our food and culture — around the globe. Chronic diseases affect one in two Americans and account for 80 percent of our health care costs. Heart disease, diabetes, cancer, autoimmune diseases, digestive disorders, dementia, allergies, asthma, arthritis, depression, ADD, autism, Parkinson’s disease, hormonal problems and more — they cause endless suffering and drain our financial resources. Clearly, what we are doing is not working. We need a different paradigm, a different model of diagnosing and treating illness that can match and beat this new epidemic of chronic disease. Our current conventional medical model was constructed to treat acute disease, diseases we have mostly vanquished. We found a single agent for illness: a microbe. And we discovered a single agent to treat it: antibiotics. The rest of the history of medicine is the pursuit of a holy grail — a pill for every ill. This approach has failed and will continue to fail. Functional Medicine is an ecological view of the body where all the networks of our biology intersect and interact in a dynamic process. When out of balance, this process creates disease, and when in balance, it creates health. Functional Medicine takes all the component parts of science, all the puzzle pieces, all the data about how we get sick and what makes us well and reorganizes it in story that makes sense, a story that has the capacity to solve our health care crisis nearly overnight if it was understood and applied widely. Modern Medicine is the youngest science. There is no theory of medicine, no organizing principles that helps us navigate the territory of chronic disease. Functional medicine is that breakthrough theory, the biggest breakthrough idea in medicine since the discovery of the microbe and antibiotics. It is a cataclysmic shift in our view of biology. There are moments of awakening in science that are not incremental but transformational: Columbus proving the earth was round, not flat; Galileo showing us the earth was not the center of the universe; Darwin explaining that species evolved and didn’t arise fixed in their current form; Einstein shattering our notions of time and space. 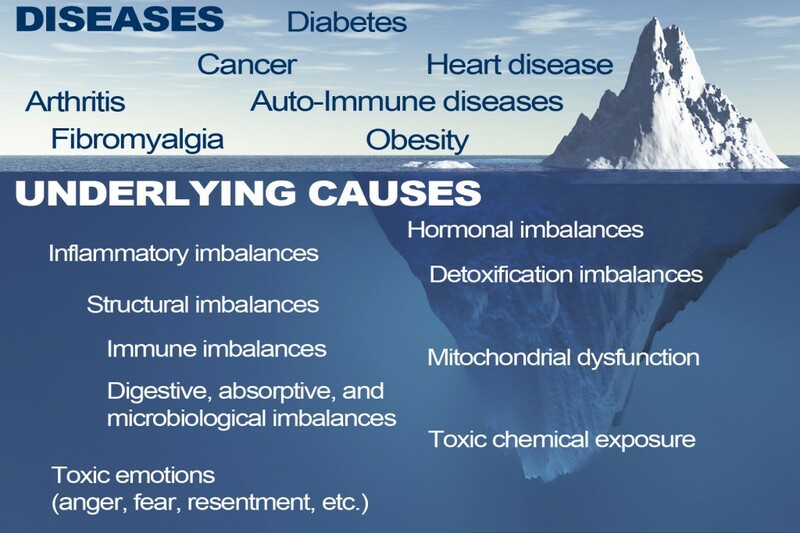 Functional medicine is a paradigm shift of equal magnitude and significance. Disease appears real and fixed, just as the earth seems flat, and time and space seem linear and solid. 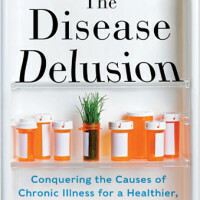 In Disease Delusion, the father of Functional medicine, Dr. Jeffrey Bland, shatters our notion of disease. Over the past 30 years, Bland has synthesized more medical science, from more fields of study than any other human alive. Disease, he argues, is a false idol. It does not exist, at least not in the way we think about it. The names we give disease are useful for finding the right medication, but not for truly getting to the root cause or creating a healing response. Consider the patient who has symptoms of sadness, hopelessness, insomnia, loss of libido and a lack of interest in daily activities. Telling this patient that he or she has depression is not helpful. Depression is not the cause of those symptoms. It is the name we give to people who happen to share them. We then treat it with an anti-depressant which works only a little better than chance. In reality, the causes for the same symptoms, for people with the same “disease,” may vary greatly. The true cause of depression may be a leaky gut caused by gluten that activates the immune system, producing antibodies against the thyroid leading to low thyroid function and depression. It may 10 years of an acid-blocking drug for reflux that led to vitamin B12 deficiency, or a gene called MTFHR that leads to folate deficiency, or inadequate sunlight caused vitamin D deficiency. It may be a diet high in tuna that has caused mercury toxicity, or a diet low in fish that has caused an omega-3 deficiency, or a high-sugar diet that has caused pre-diabetes. It may be the use of antibiotics that have altered the gut flora, which have in turn altered brain chemistry. It may be a life trauma or stress. Each of these factors – dietary, environmental, lifestyle — creates a different imbalance, yet all cause depression. Thus knowing the name of a disease tells us nothing about the true cause, not does it leads us the right treatment. This is the disease delusion Bland invites us to perceive, and that he urges us to put behind us. As a student of Functional Medicine for twenty years, as a practitioner who daily witnesses both the failures of our current model to solve our problems and the miracles of treating illness using this new medical paradigm, I am convinced that we are finally on the verge of a true transformation of medicine. Functional Medicine is not simply about improving diet, or getting more exercise or managing stress or even reducing exposure to environmental toxins, all of which are critical foundations for creating a healthy human. It is a personalized method of getting to the roots of symptoms and restoring balance. Above all, this is the science of creating health. When we do that, disease goes away a side effect. When people ask me to explain Functional Medicine, I often tell the story of Elise, a little girl of four who had suffered since she was six months old from intractable psoriasis, with red, raw, weeping skin from head to toe. Her parents took her to the top medical schools, gave her the most advanced drugs, including powerful immune suppressants and chemotherapy drugs to shut off inflammation. She had just emerged from a month in the intensive care unit after fighting a life threatening Staph infection that had been triggered by her medication (Enbrel), which suppressed her immune system. Rather than inquiring about the cause, the root trigger of her inflamed skin, doctors used medication to suppress her symptoms. Still, she was no better. No one asked about her diet, or thought about how her history of antibiotics as a baby affected her delicate gut flora setting up the conditions for inflammation. Functional Medicine led me to take a different approach. Rather than ask what drug do I use to treat the symptom, I asked what was causing the inflammation in the first place. This is a simple idea that is shockingly foreign to our medical training. In fact, the causes of inflammation are few: microbes, allergens, toxins, poor diet or stress. And I asked what her immune system needed to regain balance. Then I applied these principles by removing one common cause of inflammation in our diet – gluten, known to be linked to psoriasis, and cleared out bad microbes (yeast) in her gut that resulted from years of antibiotics and steroids. Finally, I added a few ingredients to support proper immune function – omega 3 fats, zinc, vitamin D — and probiotics to help balance her gut flora. Within two weeks her skin, which had been red, raw and painful for over three years, was clear. Not a miracle, but a repeatable result that is a natural outcome of breaking our disease delusion and employing a new framework of disease that works to solve our chronic disease epidemic. If you’re tired of being unhealthy or not feeling your best, we urge you to contact us today to get started on your own Personalized Wellness Plan® and experience the difference a comprehensive whole health plan can make! >>>To set up your own Personalized Wellness Plan and to begin living a life of energy, wellness and vitality, please click below to apply online to work with Stephen Cabral. We look forward to hearing from you!